Life in the middle of the pack isn't good enough for Shane Austin. The Hawaii freshman quarterback was ranked third at the position after three full spring practices behind Inoke Funaki and Tyler Graunke. But shake-ups in any of the remaining 11 sessions are possible, starting today. Jake Santos, Kiran Kepo'o and Bryce Kalauokaaea are also vying for the top job. If all goes right for Austin, he'll square off against his friend and former high school teammate, Josh Harrison, Sept. 27 when San Jose State comes to Aloha Stadium. Harrison has established himself as one of the Spartans' up-and-coming receivers. Quarterbacks coach Nick Rolovich admires the 6-foot, 185-pound Austin's thirst for knowledge away from the field, and his poise on it. "He's got great feet, really good feet," Rolovich said. "He's probably one of the best ones out there, as far as his drops from under center and he's just natural." Shane Austin can just see it now -- the lights, the crowd and his good friend across the Aloha Stadium turf on the opposite sideline. Besides the prospect of being Hawaii's top quarterback opening up the season at Florida in the fall, the freshman out of Camarillo, Calif., has one more item on his wish list: to compete against his childhood buddy, Josh Harrison, when the San Jose State Spartans come to Honolulu for their Sept. 27 Western Athletic Conference football game. The two go back to when they were 8-year-old youth league football players. They also combined to set several yardage records at Rio Mesa High, with the receiver Harrison as Austin's top target. Despite being future adversaries, Austin fine-tuned his throwing motion back home with Harrison during the recent spring break. "We still keep in contact all the time," Austin said after his third spring practice. "We tell each other how we're doing, actually motivate each other, because we both want to be on the field when we meet this year." While the two wouldn't be on the field at the same time (both being on offense), both could be factors in the game. Currently, the 6-foot, 185-pound Austin is doing his best to hold up his end of the bargain, earning the distinction from quarterbacks coach Nick Rolovich as one of the hardest workers at the position. "He's done everything you can do to prepare to compete," Rolovich said. "He's spent a lot of time from the day I got hired 'til today, just coming around, speaking with Coach (Ron) Lee. The effort's really there. "He's made as much progress as he can off the field ... now it's just going to take physical reps for him to take it to another level." 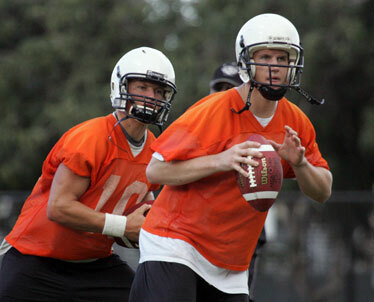 Shane Austin, left, and Tyler Graunke are competing for playing time at quarterback. As the third-string QB after the third practice behind Inoke Funaki and Tyler Graunke, Austin would have to impress over the next few weeks with second-tier reps in practice. Then, he'd have to hold off junior college newcomers Brent Rausch and Greg Alexander in the fall. Funaki, Austin's locker room neighbor, is very aware of the walk-on's potential. "He's got something about him," Funaki said. "He's gotten a lot stronger and throws the ball with some zip." Lee, the Warriors' offensive coordinator, also sees the promise in Austin -- but thinks he would do well to drop back faster from center into the pocket, allowing himself more time to assess his reads and not rush throws. "He's got a lot of work (ahead), a lot of work," Lee said. "Gotta stay focused, work on his feet (and) reads, I think he'll be OK. But he's getting reps, so he's gotta be thankful for that." Austin said that Harrison, also a freshman, has been turning some heads in the Spartans' spring practices. "He's got some speed," Austin said. "They just had a scrimmage in their spring game, I heard, and he got a couple touchdowns, over 100 yards, so he's looking good right now." 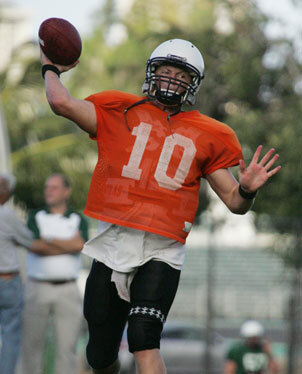 As the focal points of Rio Mesa's offense during their senior season in 2006, Austin and Harrison guided the Spartans to a Pacific View League title. There, he took snaps exclusively from under center, just as the Warriors are practicing now. The freshman is trying his best to stay within the moment, but it's difficult not thinking about the date circled on his calendar. "It'll be good, friendly competition," Austin said. "Obviously we're gonna be competitors, probably be talking a little bit, but after the game we're back to friends, you know. Give him a high-five and say what's up."